Find out which faction models make the perfect theme, and which break all the rules. Part 4 finishes up with the lads in Blue (Cygnar and Trollbloods) and thoughts on Minions/Mercenaries. Chalkboard here from Chalkboard War, with the fourth and final part of the Faction Makers and Breakers series, where we explore what models best epitomize, and most differ from, the theme of each faction (you can check out part one, part two, and part three to read up on all the other factions). In Sun Tzu’s writings about strategic attacks, he addressed the issue of expectations. “Engage people with what they expect; it is what they are able to discern and confirms their projections. It settles them into predictable patterns of response, occupying their minds while you wait for the extraordinary moment — that which they cannot anticipate.” That sentiment is what lies behind this series of inquiries into the factions of Warmachine and Hordes. Given the way the game is designed and each faction carefully managed for theme and feel, it’s easy for opponents to fall into quick categorization of a force (e.g. “it’s Menoth so they’re going to play denial”, “it’s Circle they’ve going to attack via sneaky vectors”, etc.). Clever generals will know when it’s appropriate to give their foes what they expect with a force, to field those pieces which fit the faction’s “feel” exactly. And just when the opponent is lulled into that pattern, it’s the key time to bring a surprising piece or lane of assault that uses the opponent’s own expectations against them. Hence a consideration of what makes a faction, and what pieces break with that theme. This time we’re looking at the lads in Blue: Cygnar and Trollbloods. Following that inquiry, we’ll ruminate on where Mercenaries and Minions fit in this “makers and breakers” story. Maybe the best descriptor for the Cygnar faction was uttered by Emmet in the Lego Movie: “Bang, bang, bang. Shoot, shoot, shoot. Bullet, bullet, gun. Zap, pow, zap, pow.” Cygnar is the faction of shooting. From big shooting to massed little shots, they’re the faction to do it. Cygnar is also known for electricity: empowering weapons, Electro-leaping across foes, and leaving enemy wajacks that survived the “zap” disrupted (Cygnar has eleven models/units with the Disruption special rule, and all the other factions combined have three). Finally, Cygnar has a price to pay for their ranged prowess: they’re slightly more on the fragile side than some other factions. Many of their models have respectable defense, but in terms of ability to take damage Cygnar comes up a bit short–counting on their foes to be limping when they hit close combat thanks to all the shooting. Between a lack of multi-wound infantry and some really useful light warjacks, Cygnar is left a bit on the brittle side of the equation. While there were a great number of models and units that fit the theme perfectly, perhaps nothing better gets to all the defining parts of Cygnar than the Stormwall. 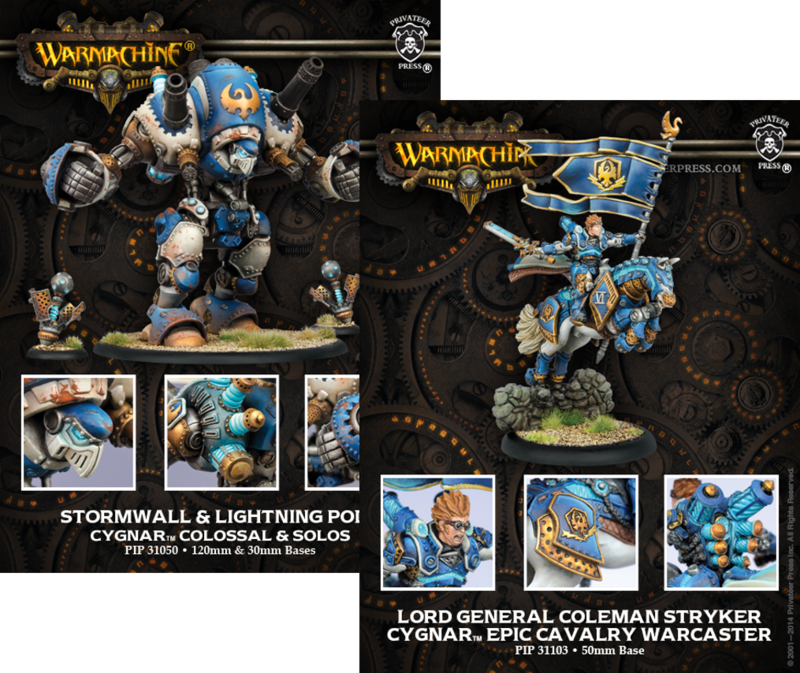 One of the more popular of the first wave colossals, the Stormwall is just perfectly Cygnar. It’s big, shoulder-mounted guns are even called simply “Big Guns”. The two gatling guns that it mounts give it options versus infantry: either straight damage to them or placing covering fire templates to deny movement lanes to one-hit models. It also has two different sets of electricity shenanigans, from electro-leaping fists to the Disruption-causing Lightning Pods that it launches. And finally, fitting to the full Cygnar theme, it’s generally better off avoiding melee. It’s certainly tougher than the average warjack, but like all Colossals it’s not as tough as it seems. So like the rest of Cygnar it generally needs to ensure that the enemy is battered before it reaches melee–something that the Stormwall is usually able to assure. It should be no surprise that Trollbloods are a sturdy faction. They have some common high armor choices that can take a hit and shrug off damage–and other units to increase their ability to do that (notably the near-mandatory in many lists Krielstone). To make matters worse for their opponents, Trollbloods are not only good at not taking damage but they are one of the best factions at recovering from damage: Snack is universal among their heavies, Regenerate is universal on their warbeasts, and Tough is faction-wide. And despite their rough and tough rules and literally rocky demeanor, Trollbloods also have their softer side. This manifests both in the fluff and the rules in the way that they are a faction focused on community. Fluff-side their story is all about the scattered Kriel tribes surviving enemies at all sides by banding together, while rules-side they are a buff-heavy faction. In particular they rely upon their solos to provide the buffs that make their average infantry great at whatever is the task at hand. The Fell Caller Hero isn’t the most impossibly tough model himself, but it’s what he brings to the rest of the force that makes him a clear faction “maker”. 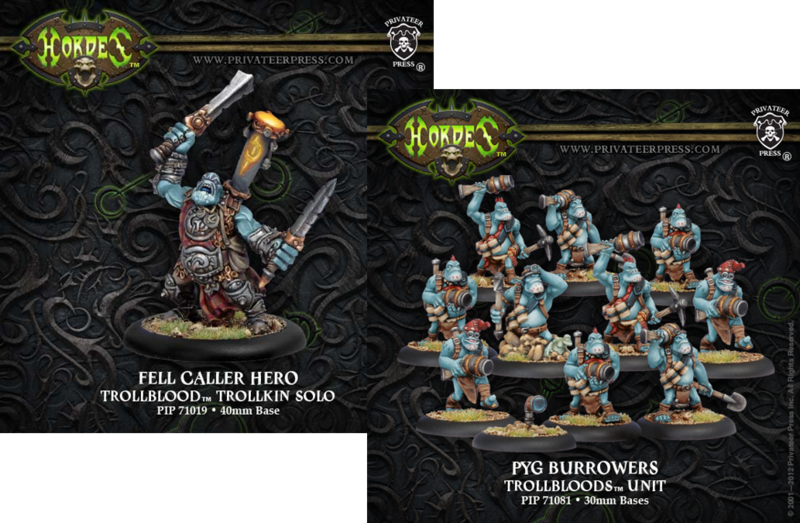 As a fell caller, his role is making the units around him better–and this is one of the most frequent of the Trollbloods solo choices to provide that community service. While the Sorcerer, Chronicler, and Devastation-new Dhunian Knot all have interesting means of protecting or buffing models, it’s the Fell Caller Hero that sets the bar for support solos. The ability to stand up knocked down models in an army where every model has the Tough special rule is where he adds to the durability of the force. Thus even crippling wounds don’t slow the Trollbloods down–yet another means of recovering from the negative effects of damage. His other two Fell Calls add other great means of support, either allowing a model/unit to gain Pathfinder or provide a unit a bonus to attack rolls. He does as the Trollbloods faction does best: works with other units to help them all take hits and retaliate with unhindered strength in return. For the faction breaker, Pyg Burrowers are a great candidate. Other than being Tough, this unit is hardly tough. Instead, they get all their survival from their Tunneling order and straight-out avoiding the foe. Tunneling allows them to move in ways that few other Trollbloods can manage, either slipping past lines or forcing the foe to keep their models tightly positioned to avoid an unexpected line of attack. The dancing around and denial element that the Pyg Burrowers bring to the table are far more reminiscent of Cryx or Circle than their own faction. Instead of taking a hit, recovering, and returning the favor, this unit hides and slides, unleashes a nasty attack, and then (usually) dies in droves. They can be effective and even devastating, but they simply do not fit the mold of the rest of their faction and thus make a good expectations breaker. The concept of “makers or breakers” is handy with factions, but benefits from a slight adjustment when talking about the Minions and Mercenaries options in Warmachine/Hordes. If we’re talking about within-pact theme, the notion of a breaker is tough. Which of the limited selection of Thornfall Alliance models could one say is not “on-theme”? Instead, I think it’s better to look outside of the pacts and toward their role when included with other factions. In many ways, Minions and Mercenaries are the ultimate “breakers” in Warmachine/Hordes. They give ready and easy ways to include something else that can break the mold or cover the weaknesses of a faction. Minions and Mercenaries can add speed to a Khador list, subtlety to a Trollbloods list, or living bodies to a Cryx list. They can provide an element of the unexpected to faction lists simply by their presence, and that unexpected can play against anticipation. And it’s not only needed to be “breakers”. It might be out-thinking oneself, but a general might include a Minions or Mercenary unit that does more of the same of what the faction is best at. That sort of doubling-up can interfere with opponent expectations in different ways. Add a Gatorman Posse to a Skorne Heavy-Infantry force and see what happens. They don’t ever “make” the faction, but Minions and Mercenaries can certainly “meet” the faction on shared ground. This series has started the conversation, but it’s by no means over: every one of the factions I’ve discussed across these articles have other contenders for faction “makers” and “breakers”. However, what’s more important than generating an exact list of which is which is that Warmachine and Hordes generals think about and then exploit the ways that assumptions about faction theme affect their games: both in list creation and opponent anticipation. ~What are your theme “makers” and theme “breakers” for Cygnar and Trollbloods? How do you use Minions/Mercs to “break” the mold? 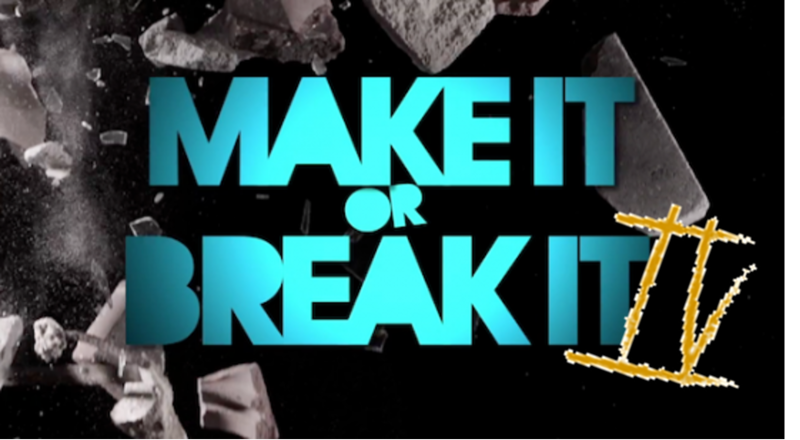 Interested in what “Makers and Breakers” Chalkboard is fielding? Check out his blog at www.chalkboardwar.com.